after a couple of days of mediocre weather we finally have some sunshine. on monday the kids were getting pretty whiny after a ton of chocolate and being cooped up due to rain. 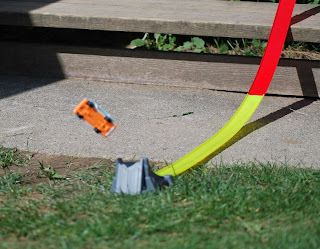 i happily pulled weeds while my husband set up the hot wheels track outside for the kids. they really enjoyed it but i think he's the one who had the most fun. my lucky neighbors have this beautiful magnolia tree in their yard. i look out at it from my chair at the kitchen table every meal (while imagining that the pile of pots and pans on the counter behind me has magically cleaned itself up).